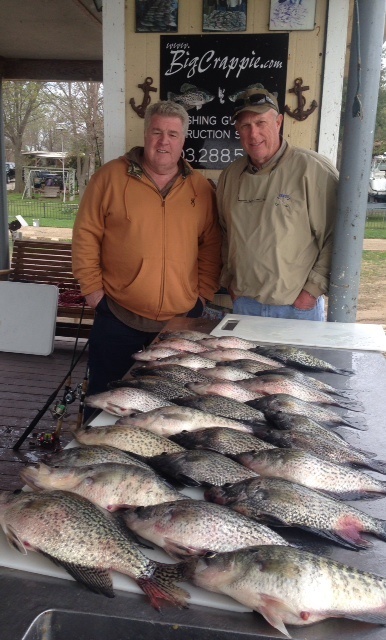 Slabs bounced in 20-30ft of water on main lake points and humps are producing good fish. Limits of fish are still common. Any color slab will work, just bounce them slowly and you should get bit if your near the fish. Hybrid Stripers are very common this time of year. Overcast and rainy days are best for the hybrid stripers. We are catching some really big crappie but overall numbers are down from the fall. If your after that 2 pounder, your odds are good at catching one this time of year. Jigs and minnows in 18-35ft of water have been the pattern. There will be days of real good fishing followed by 2-3 days of slow fishing. Weather plays a big part in it this time of year. Low winds are key since the fish are deep and we have to fish the main lake where there isn’t much wind block. Crappie - Good/Excellent - The crappie have began their move into deeper water. We have had some days when we were still catching them in 10ft of water but most of them are moving on down to about 20ft now. We are using jigs over brush piles for the best action. The bite is soft but we are catching some great quality fish. 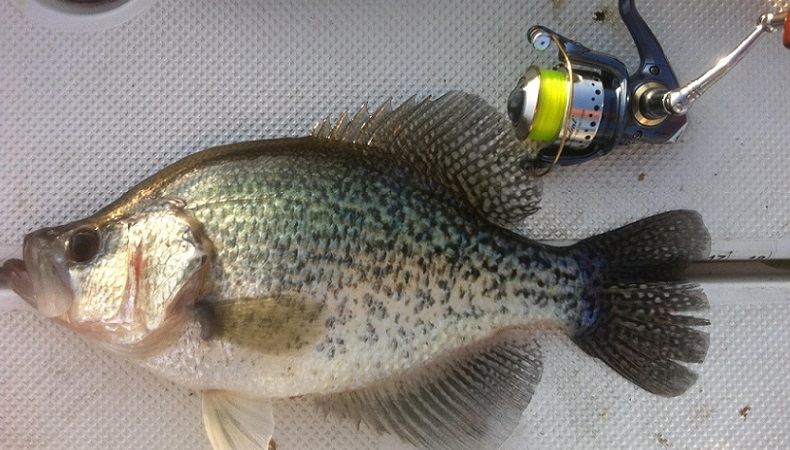 Last week we caught several crappie that were 15 inches long and weighed 2 pounds or more. Light tackle with 1/8th oz jigs is my tackle of choice. 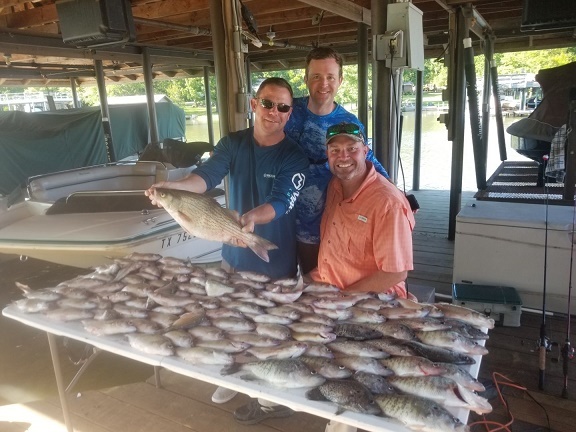 Limits of crappie with light winds are likely. Main lake points and humps are all I have been fishing. Crappie - excellent - The crappie are doing great. Jigs fished over brush piles have been producing good for us. Our best depths have been 12-20ft of water. This time of year is excellent crappie fishing. Plan on it being pretty good throughout the rest of the year. The weather is pleasant and the fish are biting, what else could a fisherman want? White Bass - Excellent- Limits are common bouncing slabs off the bottom in 10-20ft of water. Find windy points and humps and the fish will be there. Dead calm days make things harder for the whites, windy days make it easier. This time of year is a great time of year with the cool weather and pleasant afternoons. 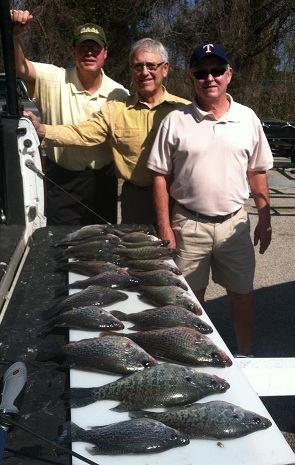 Crappie - Excellent- We are fishing brush piles in 10-15ft of water for most of our fish. Boat docks and bridges are also holding some fish. Jigs are the bait of choice with light tackle. 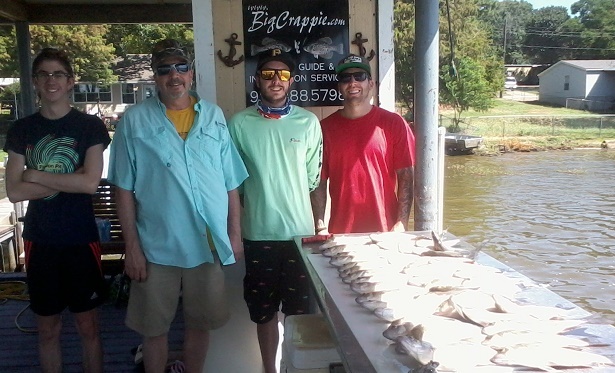 Limits of crappie have been common. 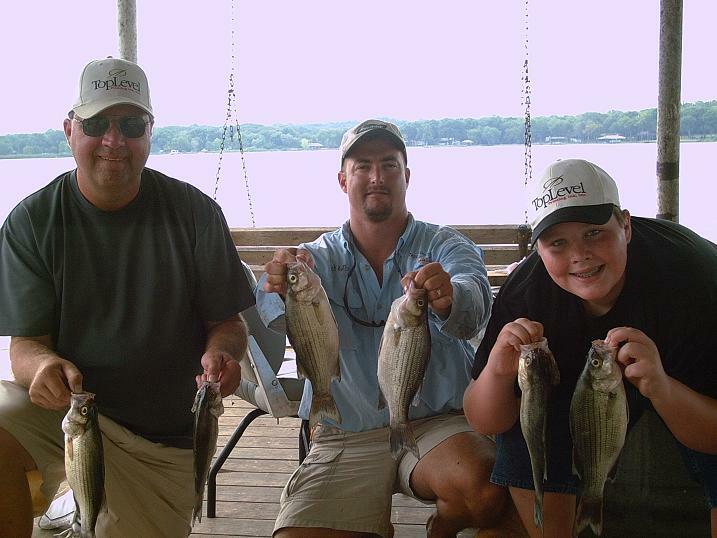 White Bass/Hybrid Stripers - Excellent - Were fishing points and humps in 10-19ft of water. The best bite has been on jigging spoons/slabs bounced off the bottom. Limits of white bass mixed in with hybrid stripers are common. 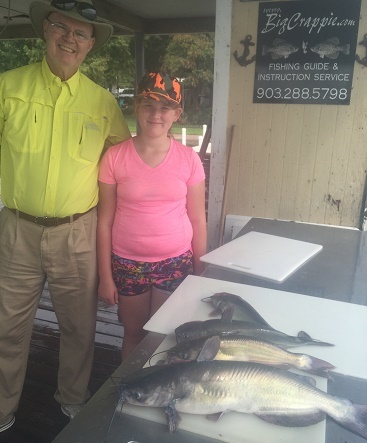 The overall fishing can be excellent through the fall until past Christmas. The crappie, white bass, and hybrid stripers all are feeding pretty good this time of year. All the female fish have already began making eggs for the spring and will therefore be needing to eat. If you normally don’t fish in the fall, you’re missing out. The weather is nice and it's generally some good fishing. Jigs over brush, under bridges & boat docks in 15ft of water. Spoons fished in 12-20ft of water has been producing good numbers of fish. Windblown points and humps have been the best locations. Whitebass/ Hybrid Stripers - Excellent bite. We are catching some good numbers of whites and hybrid stripers to 24 inches in length are common. Slabs and spoons are the lure of choice. Best depths have been 10-22ft. The latest cool front has pushed the crappie into shallower water. Jigs around docks, bridges and brush piles will be the best place to find your crappie. Color generally doesn’t matter as much as technique does. Fish slow and be precise with your technique and watch your line for strikes. White Bass/ Hybrid stripers - Limits of fish are still common. We are catching some nice whitebass and hybrid stripers right now. Slabs presented to fish on or near the bottom is producing well. Crappie - Crappie season is getting close. Generally about October they start doing well, but with the cool weather they might start a bit earlier. I will keep this section posted with the latest report. White bass/ Hybrid Stripers - Excellent bite. Surface activity early in the morning is not uncommon. After about 8 am we then bounce slabs/spoons off the bottom with good results in 10-18ft of water. Limits of fish are common this time of year. Crappie - Slow. Jigs and minnows fished over brush in 15-25ft will produce some crappie. The crappie should pick up as soon as the water temp begins to drop. I am doing whitebass/ hybrid striper trips until that time. Surfacing fish early in the morning from 6:00am-7:00am then slabs bounced in deeper water has been producing good numbers. Jigs or minnows fished over brush or deep boat docks will produce some fish. I am doing whitebass/ hybrid striper trips until October unless special arrangements have been made. July has started out excellent! The white bass and hybrid stripers both have been very cooperative. Top water action early in the morning and bouncing slabs off the bottom later in the day has been the technique. Limits of fish are common this time of year. We start at daylight and are generally back by 10am with plenty of fish. Full day trips are running until about 2-3pm. 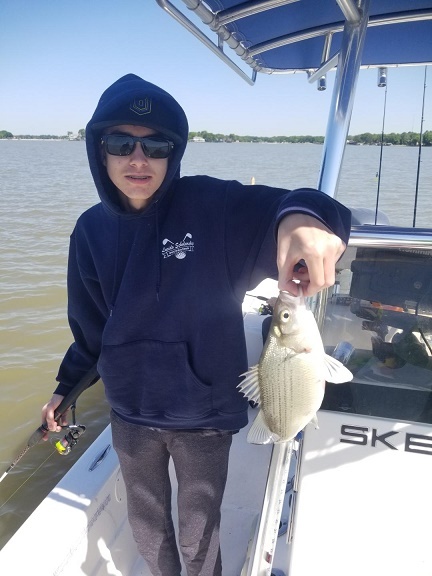 White Bass/Hybrid Striper - Excellent bite, limits are common. Slabs bounced off bottom and casted shallow early in the morning are producing excellent numbers. Surface activity is common with mixed in hybrid stripers. Crappie- fair bite, jigs in 15ft of water over brush piles are producing good fish. Fishing is fast at times but we are having to put in our time to catch good numbers of fish. 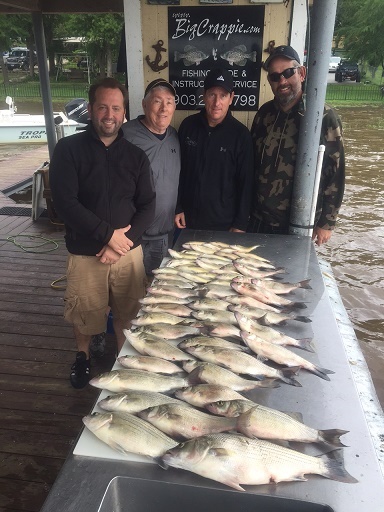 White Bass - (Excellent) limits are not uncommon this time of year. fast paced action is what makes these fish fun. If you get on a big school of them you can catch a limit very quickly. Humps and points are the most likely places to find these fish. 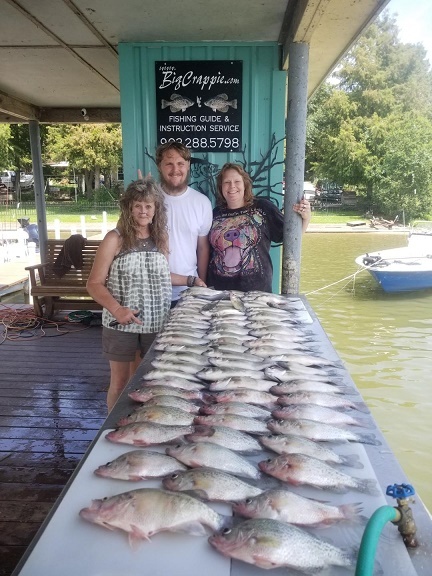 Crappie (Fair-Good) Fish brush piles and deep boat docks with jigs. We have been catching some nice fish but not real high numbers of good fish. Lots of short fish are also being caught. Crappie - (Excellent) The crappie have moved back out to a little deeper water. Brush piles and deep boat docks are holding the most fish right now. 10-18ft is the best depth. Bridge columns can also hold some crappie from time to time. White Bass - (Excellent) Early morning and late evening surface bite and then look for them on deep humps and points. 15-20ft is the best depth and slabs worked near the bottom will generally produce the most fish. The crappie are still in the shallows. They are biting excellent right now and the pattern should hold for another couple of weeks. Then expect them to move out into a little deeper water after they finish spawning. Jigs over brush tops in 12-15ft of water will work excellent. The area on the lake right now is the mid lake area close to the spillway. Find your brush piles and work your jig slowly over the top and hang on! White Bass - Biting excellent. good numbers are being caught on slabs in 2-20ft on points and humps. Early morning they are shallow then move out as the day warms up. 1 oz slabs are best used for jigging them vertical. The south end of the lake near the dam is a hot area right now. Also look for birds and surfacing fish. Remember to use your trolling motor to not spook the fish. White Bass/ Hybrid Striper - Good/ Excellent.. Bounce slabs and throw Sassy Shads over humps and point in 15-25ft of water. Also look for birds that are feeding on the shad that the fish might be pushing to the surface. Crappie - Expect to find most crappie in less than 12 ft of water. Boat docks, shallow brush piles, and weed banks will be holding the most fish. 1/32-1/16th oz jigs are best. The spawn is just getting started here on Cedar Creek. The recent big rains have kept the water temps down but they are getting right again now. White bass - Whites can be found on windy points and humps in 12-20ft of water bouncing slabs. Chrome and Chartrues are the best colors. They can offer some fast action at times and pull your line great. 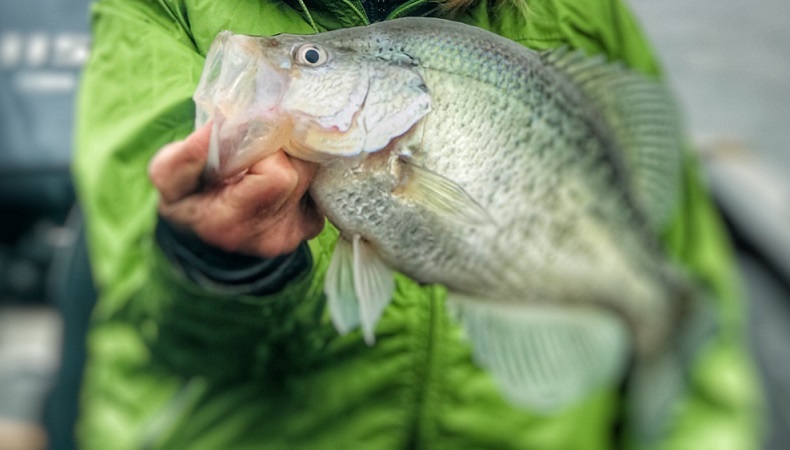 Crappie - Water temps reached the high 50's over the weekend and pushed some crappie up shallow. The recent rain and cold front could postpone the shallow bite a few more days. Most fish should be less than 15ft though and can be caught using jigs and minnows around brush, boat docks, and bridges. Whitebass - They are biting excellent again. Most of them are in shallow water spawning. Casting road runners, or rattletraps over points and humps should produce fish. Bouncing slabs on the bottom has been my least effective method right now. The white bass are biting excellent again. We’re are catching them on light tackle. The fish are 12-17inches long and offer a great fight. They should continue to do well for the rest of the year. Crappie - The crappie are in a prespawn pattern. We are catching them on jigs in 10-20ft of water. As the water warms up over the next two weeks expect them all to come up into the shallows. They will be in the 2-12ft range until post spawn which is in Late April/ early May. The crappie fishing should get really good for a while and I know you’re ready for that. White bass/ Sandies - "If your wanting to catch whites/sandies while there in the creeks spawning call me now!" The spring spawn has started already! I am catching good numbers of whites on artificial bait. Limits of good size whites/sandies is common throughout the rest of the year from this point on. We use ultra light tackle on these 12-17 inch fish to make them even more fun! Crappie - We are still catching some really nice crappie in 20ft of water. Jigs in Chartrues are the bait of choice. The bridges are beginning to hold some fish too. 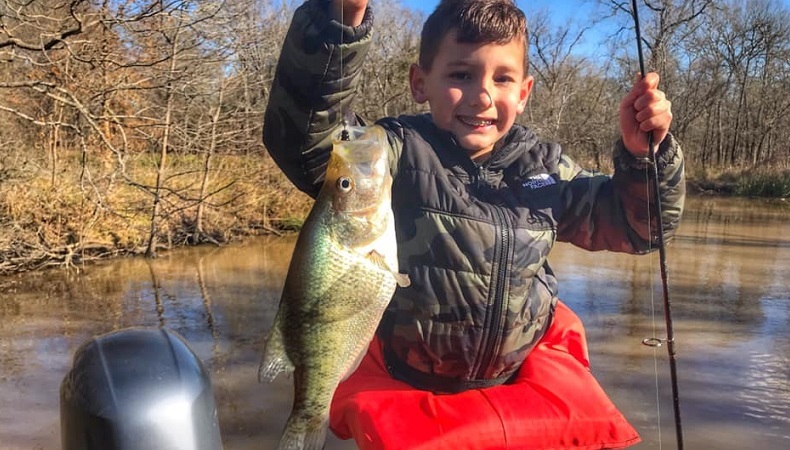 Expect deep boat docks, bridges, and shallower brush to start holding crappie as the month continues. Warm weather will drive the fish into the shallows as early as mid Feb.
White Bass - 20-26ft is the magic depth and slabs are the bait of choice. 1 Oz slabs fished right near the bottom will produce the best. Expect the whites to go much shallower by the end of the month.